One of the most iconic celebrations in Spain, the annual Running of the Bulls in Pamplona, is actually part of an annual festival known as Sanfermines in honor of Saint Fermin, which takes place each year from noon on July 6 to midnight on July 14. The San Fermin Festival is split into the two parts: opening day and the other seven days. On opening day, the festival starts with the lighting of the chupinazo, a pyrotechnic rocket fired from a city hall balcony at noon, and revelers around the city participate in water, wine, and flour fights in the streets. The rest of the week, Pamplona settles into a pattern of 8 a.m. bull runs, 5 p.m. bullfights and nighttime parties. The Pamplona Bull Run (El Encierro in Spanish) and the San Fermín festival didn't really gain their current popularity until the early 1970s, but they've both been a part of Spanish culture for centuries. The bull run has origins dating back to the 14th century, when bullfighting became popular in Spanish cities and the cattle had to be transported through the streets, and the festival coinciding with these bull runs first started in the 16th century when the Catholic Church switched its holiday honoring Saint Fermin from October to July. Now, the San Fermin festival and daily bull runs have become one of the most popular events for tourists visiting Spain in the summer. Each July, thousands of people from around the world make the journey to witness and take part in this unique cultural celebration. If you are visiting northern Spain this July, book your hotel tickets in advance so you don't miss out on the action of the annual festivities. To save on accommodation costs, many people travel overnight from a city further away, or travel in the daytime the day before, party all night, watch the bull run and then travel back without stopping. However, this is ill-advised if you plan to run with the bulls as participants are expected to be sober and well-rested before joining the run. It's relatively simple to get to Pamplona from a number of nearby cities as most have buses or trains with direct access to the city. You can take an overnight train or bus from Madrid, the capital of Spain, and the thriving metropolis of Barcelona is only a few hours further. Alternatively, you can also rent a car and drive from the nearby city of Vitoria, Bilbao (home to the Guggenheim Museum), or San Sebastian, which each offer cheaper accommodations away from the crowds of the San Fermin Festival. Hotels in Pamplona during the festival are very expensive. A good alternative is to do a Pamplona guided tour, which can originate in either Barcelona, Pamplona, San Sebastian, or Bilbao and typically includes two days at the festival. You can book a hotel (or campsite) in Pamplona, stay in a nearby city or stay further away and travel overnight, arriving just in time for the morning run. There are many hotels in Pamplona, but a lot of these will be fully booked months before the festival begins. Also, as the whole of Pamplona turns into a party zone at night during the San Fermin Festival, getting a decent night's sleep might be difficult. However, if you stay up all night to enjoy the festivities, there's nothing better than being able to fall into bed after the running of the bulls in the morning. If you intend on sticking around for the bullfighting in the evening, you'll welcome somewhere to sleep in Pamplona itself. To stay in private accommodation along the route, San Fermin Travel Central can help you book a place to stay during the festival. You can also book accommodations in and around Pamplona on your own by browsing websites like Tripadvisor. The cheapest option, though, is camping, and the nearest campsite to Pamplona is Camping Ezcaba, which is about six kilometers outside the city. Other campsites are about 25 kilometers outside the city and include Camping Aritzaleku, Errota, Iturbero, Lizarra, and Camping Urrobi. Since the days of the San Fermin Festival fall into a routine after the opening ceremony, you can rely on the Pamplona Bull Run schedule to stay consistent, so it's easy to plan your trip around the day's festivities. However, when the city's not out watching the bull run at 8 a.m. or catching the bullfights at 5 p.m., most residents and visitors to the city choose to sleep during the daytime so they can party all night. As Pamplona isn't really geared up for tourism during the rest of the year, there isn't much of a tourist infrastructure to keep you occupied while others sleep away the day. The wineries of La Rioja aren't far away, but you'll need a designated driver for a guided tour. Alternatively, you could explore part of the region around Pamplona—you might even find another bull run elsewhere in Spain. With plenty of great sights, outdoor adventures, and historic tours offered within a few kilometers of Pamplona, there's no reason you can't catch a bull run in the morning, head out to the countryside in the afternoon, and return for the bullfight in the evening. The bull run is 2,750 feet (825 meters) long but the most action is at the Cuesta de Santa Domingo, which is where the run begins, and at the bullring (where everything finishes). Whether you hope to run in the encierro or you just want to watch from the sidelines, there are a few tried and true tips to help you have the best San Fermin Festival possible on your trip to Spain. The difference between getting nearly the best vantage point at the Cuesta de Santa Domingo and the very best place to watch the action is about three-and-a-half hours—you'll need to arrive well before the bull run to get the best view. By 3 a.m., all the spots by the railings will already be filling up, but even as late as 6:30 a.m. (an hour and a half before the run), the crowd gathered is only one or two people deep. While getting to the Cuesta de Santa or the bullring this early may seem like a tedious task, many revelers will be partying in the street while they wait for the run to start, so you won't likely get bored, even if you show up at 3 a.m. However, if you don't want to go through the hassle of securing a spot along the railings, you can also rent a balcony overlooking the daily bull run. When it comes to getting the best and safest view of the bull run and opening ceremony of the San Fermin festival and Pamplona Bull Run, renting out a private balcony from one of the locals of the city is your best option. Not only do you get to stay out of the way of all the mess in the streets, you don't need to stand in your spot for hours to guarantee a good view of the event. Additionally, balcony spots provide a few more creature comforts like blankets and heaters, televisions for viewing the broadcast of the event, and an unmatched view of everything from above. However, the balconies can also be a little expensive to rent, especially since most of the action takes place in a brief flash as the runners and bulls continue down the route toward the bullring and out of view. You'll also miss out on a lot of the atmosphere and energy of the event by not immersing yourself in the crowd on the street level. Since Pamplona's old town is like most older cities in Spain—with cramped buildings and haphazardly-arranged streets—each balcony will offer you a different view, and some will be better than others. As a result, make sure the owner either shows you pictures or lets you see the balcony in person before you decide to rent. Choose a balcony on either the second, third, or fourth floors (known in Spain as first, second, and third floors), as views from further up will likely be difficult to see. If you want to take pictures, make sure you know where the shadows will fall on the street below. The runs take place at the same location each year, at 8 a.m. each morning, which means the sunlight and shadow will remain consistent year to year. There are a few essential items to bring in your backpack, each of which can help you experience the bull run, fights, and parties with relative ease and comfort. 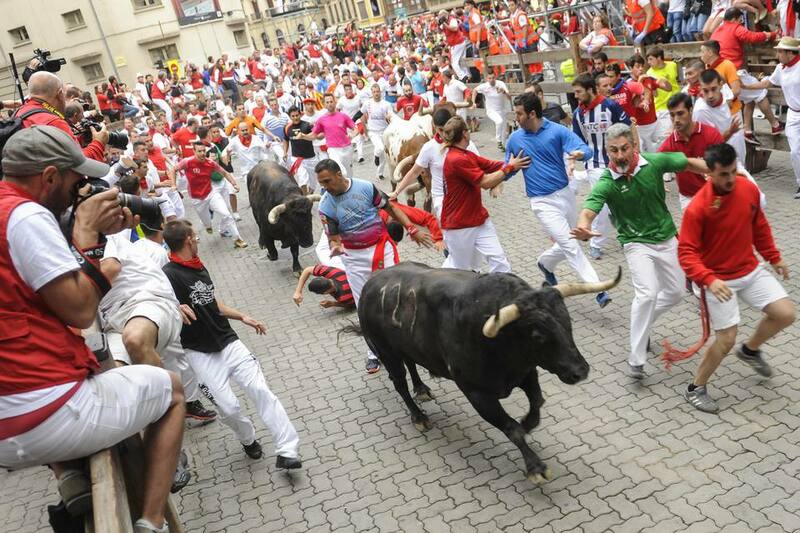 Most people running in and watching the encierro each day wear white trousers, a white shirt, a red handkerchief tied around the neck, and a long, thin red scarf tied around the waist. Whether you're male or female, young or old, if you don't dress appropriately, you'll stick out like a sore thumb. Fortunately, although white pants are a little harder to come by in the city, you should be able to purchase a white shirt at one of the souvenir shops in town and a red handkerchief and scarf at the festival itself. Bring a blanket or sweater if you plan to stay out overnight though, as temperatures can get rather chilly in the early morning. If you're into drinking, stock up on the preferred drink of choice for the San Fermin Festival: Calimocho ("Kalimotxo" in Basque). All you'll need to make Calimocho are two liters of red wine mixed with two liters of Coca-Cola topped with ice. Sharing your bottle of Calimocho is a great way to meet new friends. Additionally, you should bring things to entertain yourself while you wait for the bull run to start or to kill time in the afternoon before the bullfights begin. A newspaper can help you find local events and attractions nearby while a deck of playing cards can help you meet new people and pass the time. "A San Fermín pedimos, or ser nuestro patrón, nos guíe en el encierro dándonos su bendición." How Many People Have Died at Pamplona's Running of the Bulls?